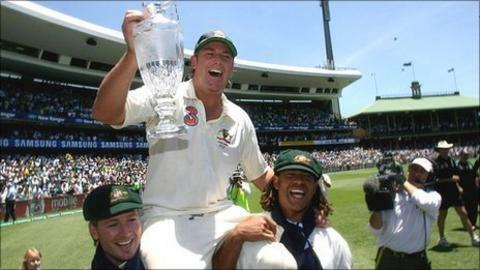 Shane Warne has likened Andrew Strauss's in-form England side to the great Australia teams he played in. Warne starred in an Australian side that twice won a record 16 consecutive Test matches. He sees similarities with an England team 2-0 up in the series with India. "England are improving and have a hunger for victory. They have a good team spirit and, as Andrew Strauss says, they can still improve," Warne wrote in the Daily Telegraph. Warne, who played in 145 Tests, cited England's "aggression" as a key reason for their two victories over India, including the emphatic 319-run win at Trent Bridge, completed on Monday. "When Australia were on top and dominating world cricket, the things we wanted to do were score fast, take the game away from the opposition and intimidate the tail," he said. "England are doing all those and showing qualities that will make them number one if they continue. "Don't forget they were 124-8 on day one of this game. "This match turned because of the England bowlers' aggressive mindset. "They were able to make the pitch look completely different from when the Indian bowlers were toiling. "At times the pitch looked flat when India were bowling but, by showing intensity, aggression and a lot of hunger to be the best in the world, England demonstrated what could be achieved." Meanwhile, India's form has led to criticism from the media and former players back home. The Times of India newspaper ran a front page opinion piece headlined: "This team does not deserve to be no. 1 test side in the world" on Tuesday. "Thousands of those who saw India's craven surrender at Trent Bridge will find it hard to believe that this is really the world's No.1 Test team," said an editorial in the paper. Former India players were also highly critical. Former captain Bishan Singh Bedi said spinner Harbhajan Singh should be dropped. "Harbhajan has played enough on the weight of reputation alone," he said. Former opener Angshuman Gaekwad backed the inclusion of leg-spinner Amit Mishra for Harbhajan in the third Test. "Mental pressure leads to technical problems too", he said. And former batsman-wicketkeeper Farokh Engineer questioned whether Duncan Fletcher - the former England coach - was the right man to lead India. "What are these highly-paid coaches doing?" he asked.